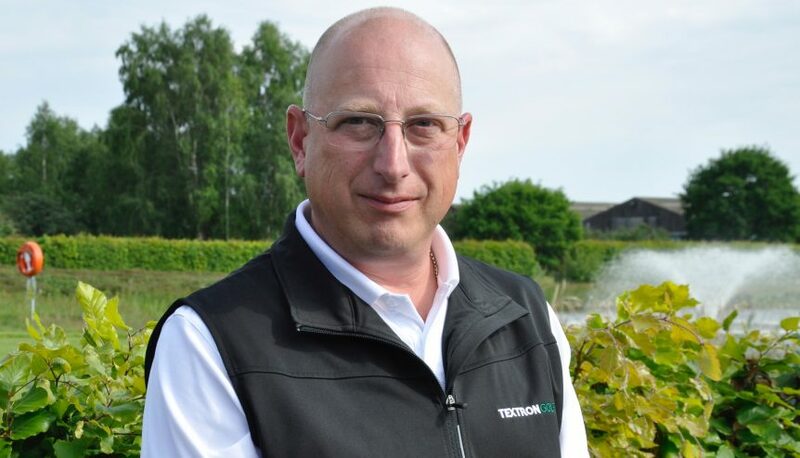 Rob Hayward is an export sales manager at renowned turf equipment manufacturer, Ransomes Jacobsen. Rob manages several dealerships in the U.K. and Sweden, with a special interest in sprayers, developed during his time as a greenkeeper. In this article, Rob discusses sprayers, the common causes of poor performance, and the technology surrounding sprayers today. A sprayer will be a very familiar piece of equipment for many. Knapsack, tractor mounted or perhaps self-propelled, it’s an essential piece of equipment for any fine turf facility. 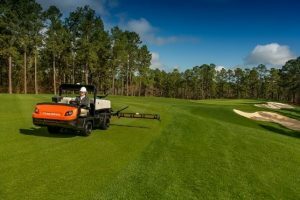 In this article, we look at sprayers in general, the common causes of poor performance, and the effect that advancements in technology will have on sprayers of the future. A sprayer is fundamentally a delivery system for a liquid product. 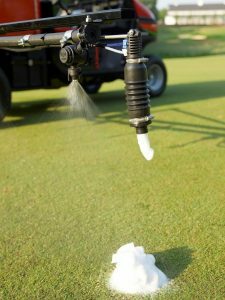 It can, with the correct nozzle, deliver either a contact product to the leaf, a systemic product to the plant roots for uptake, or wetting agent to the soil. The cost and complexity of these products is increasing all the time, as are the controls and legal restrictions associated with the delivery of pesticides and other products. Therefore, it’s important to understand how the sprayer works, and how, given the cost, legal and ethical considerations, to set-up your unit for the best performance. The basic sprayers will have a manual pressure control valve and either levers or electric switches to activate the boom(s) depending on the size of the sprayer. These units often hit the cost requirement, but the very simple controls do mean the units must be accurately calibrated and carefully driven to achieve the desired application rate. Attaining a constant speed over undulating ground is not easy, so the errors can, and do, add up. Many operations have now moved to a mid-range sprayer, where the controller can measure and vary the flow rate to match the forward speed (within a certain range), and therefore deliver a consistent application rate (litres per hectare). This is more expensive to buy, but a lot of the errors caused by poor speed control are removed by the variable flow rate and the controller. Providing you get the nozzle selection right, the controller should be able to handle the rest for you. There are fully computer driven sprayers with GPS speed measurement and the option of real-time mapping of the target areas. There is also individual nozzle shut off, to prevent any overspray or overlapping. “Pulse width modulation” nozzles, mounted in pairs give such a wide range of application rates that once set-up, the operator shouldn’t need to change the nozzle size again, and they always deliver a consistent application rate regardless of the changes to the forward speed. So there really is something for everyone in the range of sprayers, and they all have one thing in common: nozzles! All sprayers deliver the liquid product through a spray nozzle. These are essential for the correct and efficient operation of any sprayer, but unfortunately, they are often the most overlooked part of the machine. The nozzle controls both the spray pattern and the droplet size. They have an operating range and the spray opera tor must use a selection chart to ensure that the nozzles they are using are actually capable of delivering the required rate at the desired forward speed. There are plastic, metal and ceramic nozzles available, and the selection is driven by the type of product being applied, how abrasive it is, and how much you are aiming to apply. Spray nozzles of course wear, and they can also get blocked by partially dissolved chemicals or other debris within the system. Nozzles can also be easily damaged causing poor spread, or gaps in the spray leading to streaking. So, they must be checked regularly, and a good operator should be regularly checking the spray pattern to see if there are any issues. A small pin and an old toothbrush should be carried to clean any nozzles that need attention. Never put a spray nozzle in your mouth and blow through it! A critical part of spraying has always been selecting the right speed, and then sticking to it religiously. It is easier said than done, but for those with the base model sprayers it is essential for a consistent application rate. On undulating ground the forward speed will increase going downhill, and decrease as you climb even a gentle slope, and this of course changes the application rate. Hydrostatic drive systems are the most prone to this problem and the only real solution is to use a mid-range or better sprayer, so the varying speed can be matched to the flow rate (by the controller), thereby giving you an accurate application rate. Mechanical drive systems are better at holding the forward speed, but they can also vary over undulating ground. One solution is to use a ground speed governor, this mechanical device will reduce or increase the throttle to maintain the engine speed, giving you a constant forward speed. The Cushman Truckster, for example, has always used this system, and it is far more accurate than using a hand throttle to set the forward speed of the vehicle. For those using a top of the range sprayer, speed is far less important to the accurate application, as the wide operating range of the twin nozzle systems mean they can cope with most speed variations without any operator input. This allows the operator to concentrate more on where they are going, than worrying about the speed. It seems obvious that the operator must carefully steer the sprayer, as missed areas can be very noticeable, and overlapping wastes expensive product and can also lead to over application issues. Areas like semi-rough don’t need the same levels of attention, so spraying them as well can be a waste of product, and an ethical/ecological concern. Base units just have to do the best they can to avoid missing or streaking, and on fine turf areas this can mean applying a 50% weaker mix and double applications in different directions (very time consuming, and therefore expensive). Mid-range unit may have foam markers, which certainly help on larger areas and if the pressure of speed control is removed by a controller, then more attention can be given to maintaining correct bout matching (maintaining a one nozzle overlap for an even application). Top of the range units will have an onboard mapping display, showing the areas which have not yet been sprayed, while individual nozzle control will shut off each nozzle independently to avoid any overlapping. This is where a more expensive sprayer can save money on expensive product applications, get better results, and reduce spraying times as the operators simply drive over the area and the sprayer does the rest for them. Managers can even set up “no spray” zones using the mapping software. This would stop spraying into a fairway bunker, for example, giving a further saving of product. For even greater accuracy and to assist with operator error and fatigue, self-steer options for dedicated sprayers are also coming into our market. This would have been the obvious starting point for a sprayer article, as every sprayer needs to be re-calibrated regularly. Hopefully leaving it to the end of the article will not mean that you overlook it! 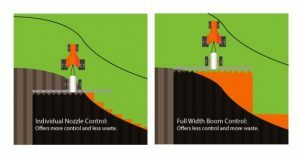 Calibration, much like nozzle maintenance, is an area so often overlooked, but can have a big impact on product application rates and the resulting costs or the results of different applications. 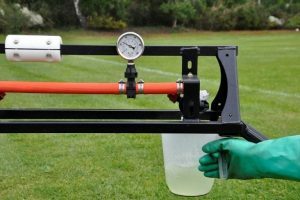 Base model sprayers will need to be regularly calibrated, to ensure that the flow rate and pressure combination is delivering the right amount per minute. Without accurate calibration it’s all just guesswork and luck. For the higher specification units, calibration is still needed to check nozzle wear. As the flow rate for each boom is checked, it is also a good time to check the spray pattern and identify any nozzles which need cleaning, or replaced. So, get that measuring jug out and check your sprayers calibration! After each use, the sprayer should be emptied out and flushed with clean water to remove all traces of the product. A safe and environmental (as well as legal) disposal method must be used. Remember that the nozzles may have filters fitted to them, and these should also be checked for any deposits, its not just the tank that needs to be flushed. Unless it’s a clean sprayer using just water (on a demonstration event), the operator should always wear the current PPE. Boots, waterproof overalls, nitrile gloves and a face shield. Wash facilities must be available to the operator and the warning labels on the product must be read and understood by the operator.